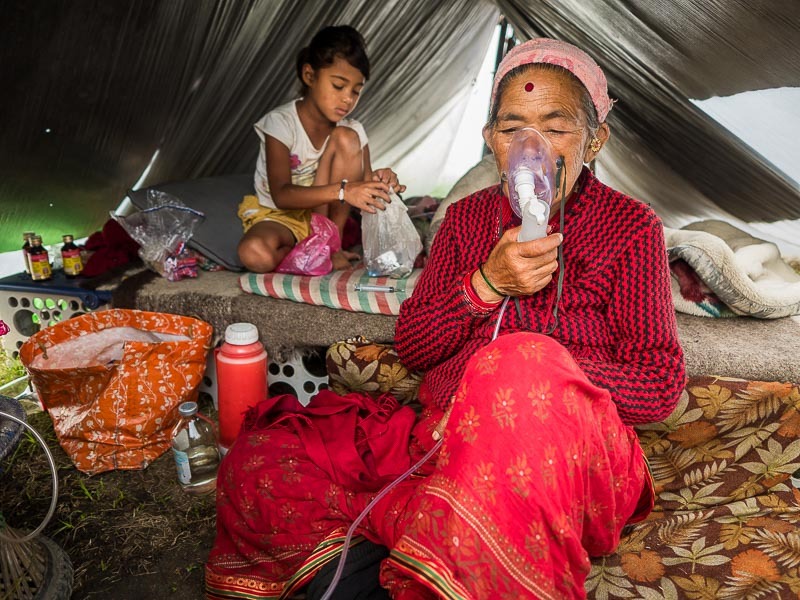 A woman in her tent gets a breathing treatment in an IDP Camp in Kathmandu. Most of the IDP Camps and refugee settlements that sprung up in Kathmandu after the Nepal Earthquake on April 25 are gone. People are no longer sleeping in the streets around the capital. 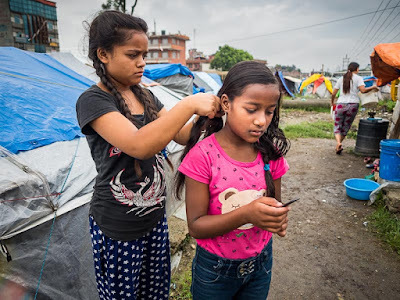 There are still some IDP Camps in Kathmandu though. One of the biggest, possibly the biggest, is right next to the Hyatt Regency Hotel in Kathmandu. 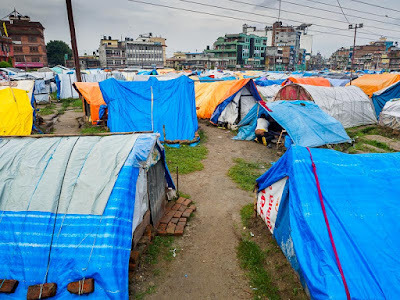 More than 1,800 tents, home to more than 7,000 people, are jammed into a small park, a little bigger than a soccer pitch, right next to one of Kathmandu's most expensive hotels. 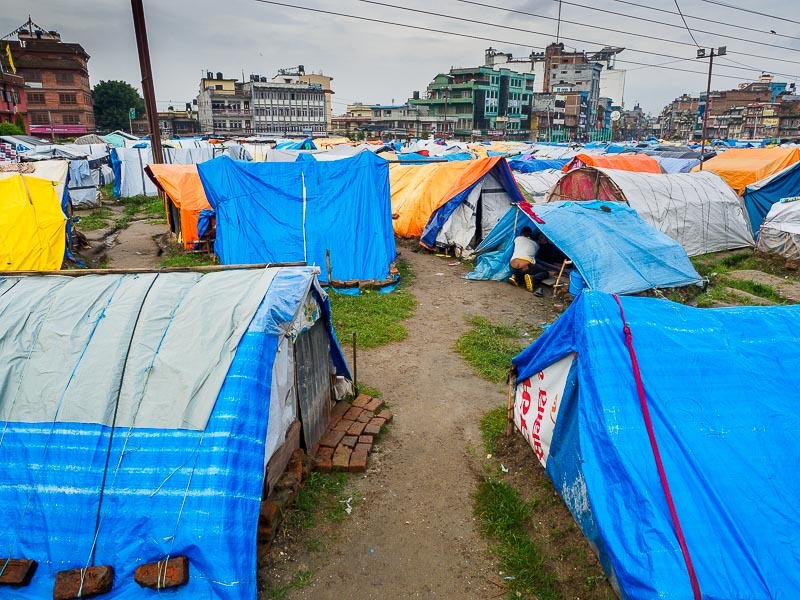 1,800 tents, housing 7,000 people in Kathmandu. Conditions in the camp are not easy. Most of the residents are from villages in the mountains, six to nine hours from Kathmandu. There is no electricity in the tents. There are water distribution points, from large bladders provided by NGOs, on the edge of the camp. There are latrines around the perimeter of the camp. 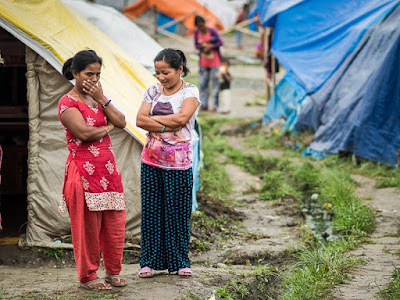 Women chat in the camp. There is no plumbing or storm sewer system though. 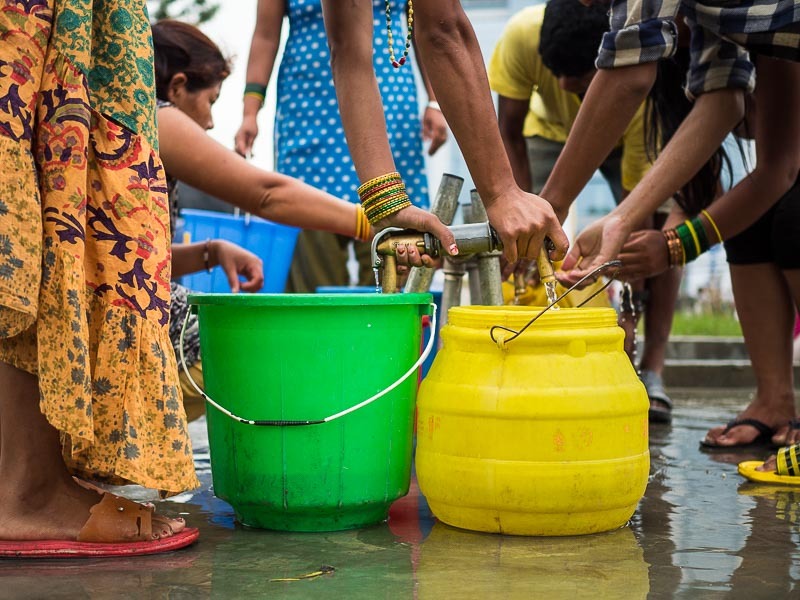 Water runs in rivulets between tents. 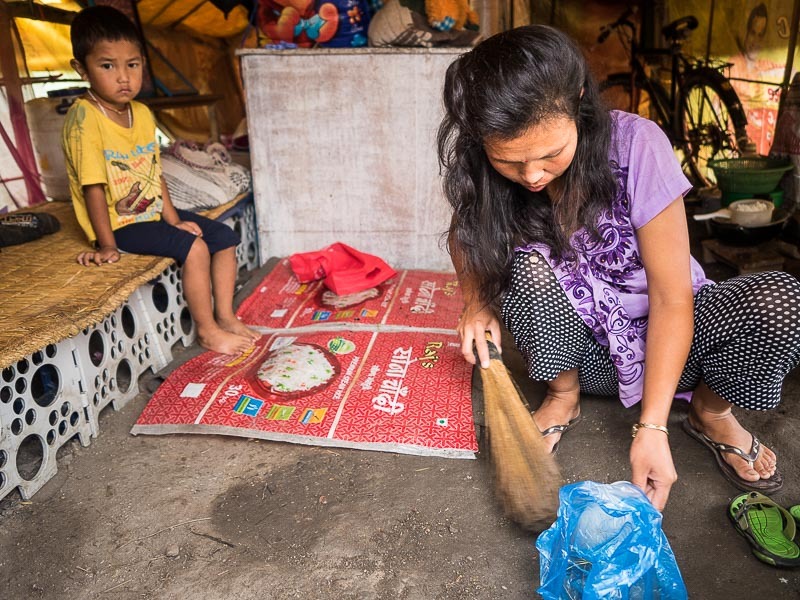 People do their laundry and wash their dishes between the tents. The ground between tents is frequently water logged and muddy. 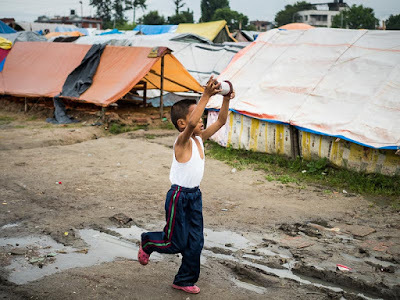 It rains for days at a time in Kathmandu and rain water runs down the sides of the tents. Many of the tents leak, and water runs into the shelters. Some of the "tents" aren't even tents at all. They're tarps strung together. A man who injured his leg in the earthquake eats a pomegranate in his "tent," really tarps strung together. Even though many of the people here were injured in the earthquake, there is no clinic in the camp. People who need medical care have to walk or get themselves to the public hospital, about a 15 minute walk from the camp. There is no food or ration distribution in the camp. Residents are responsible for their own needs. Remember that many of the people here are from far outside Kathmandu. They don't have jobs in the city and they end up wandering the streets looking for day work or soliciting donations. There was no law enforcement presence in the camp when I was there. People at a water distribution point. The trees in the background of the top photo mark the boundary of the Hyatt Regency property. This seems like a recipe for disaster. Thousands of people living in wretched conditions next to conspicuous opulence of first world wealth. 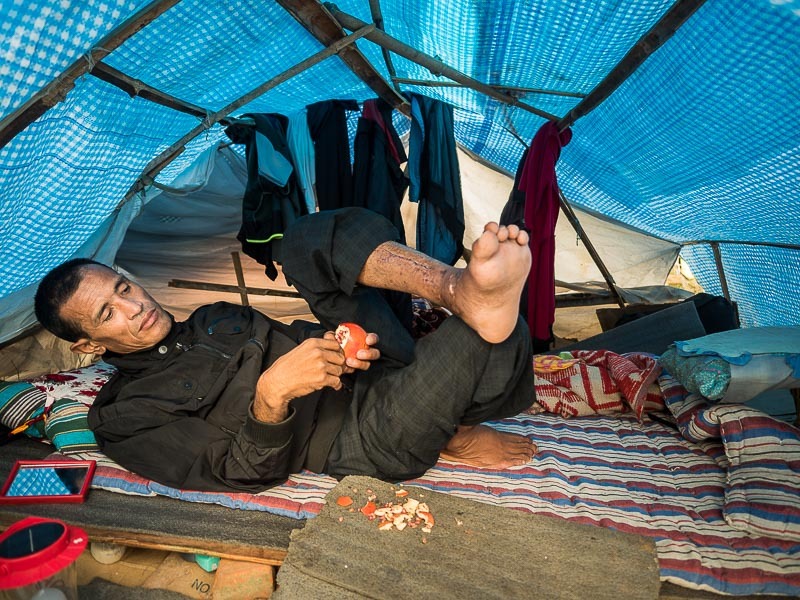 Working in the camp, I was stunned that such conditions are allowed to fester. But when I started talking to people, I was amazed by people's acceptance of their situation. While sisters brush out each other's hair. I asked a man who identified himself as the "President" of the camp if people were getting any help from either the government or NGOs and he told me that everyone was on their own. But he added that at least they had cover and that many of the homes in the mountains were completely destroyed. He asked me to include in my reporting that the one thing Nepal needs now is for the tourists to come back (a recurring theme I heard the entire time I was in Nepal). A woman cleans the inside of her tent. Life in the camp is difficult. It's beyond what most Americans would be willing to endure but there is also a sense of community in the camp, of people working together in a bad situation, all hoping to go back to their homes in the mountains.